Born in New York City on September 19, 1971, Sanaa McCoy Lathan is a Tony-nominated actress (for A Raisin in the Sun) who has been the recipient of accolades not only for her work on Broadway, but for her equally-powerful performances in movies and on television as well. She might be best known for the romantic comedy Something New, for which she landed an NAACP Image Award nomination last year. But the 5’7’ beauty's screen credits also include memorable roles in Love & Basketball, Brown Sugar, The Best Man, Life and Alien vs. Predator. Sanaa received another Image Award nomination for the critically-acclaimed FX Network series Nip/Tuck. This past February, she reprised her role as Beneatha Younger opposite Sean Diddy Combs for the ABC-TV adaptation of A Raisin in the Sun. Here, she talks about her new movie, The Family That Preys, a dysfunctional family drama co-starring Taraji P. Henson, Alfre Woodard, Kathy Bates, Robin Givens and the film's director, Tyler Perry. KW: Hey, Sanaa, thanks for another interview. SL: Oh, it's my pleasure. 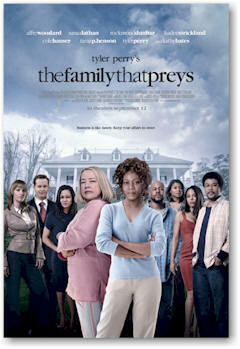 KW: As the daughter of a director/producer [Stan Lathan], did you find yourself comparing Tyler Perry to your father? SL: Oh no, no. I've never really worked with my dad as an actress. KW: How did you like working with Tyler? SL: Tyler's great. I love how he's constantly working on a scene, adding lines. You never know what the scene's going to turn out to be because he does it so many ways. He encourages improv and does lots of takes, so it was great. He's such a professional, and he has an amazing situation down in Atlanta with the studio and with the crew. Everyone is so professional, and they have a shorthand for working, because they've been doing it together for a long time. And I really liked Atlanta. KW: Was that your first time shooting a film there? SL: It was! I really kind of fell in love with the city. And this cast, we really hit it off, so I'm actually friends with a lot of them now. I had a blast. KW: How did you like playing Andrea? SL: I enjoyed it because the role is such a departure from everything I've done. She's kind of like the villain. Another thing I love about this movie is that it's not about race. It happens to be about a white family and a black family, but it could just as easily be any family. we're not dealing with the race issue. we're just dealing with family relationships, friend relationships, marital relationships and infidelity. KW: I hope there's a trend towards this sort of colorblind casting. SL: Exactly! It's about time. People have to open their minds. KW: This picture pairs you with Taraji Henson again. SL: Yeah, but we only had a couple scenes together in Something New, and there were always about three other people in each scene as well. This was fun, because we really got to play and got a chance to get to know each other very well. KW: How was it reuniting with Diddy to do a made-for-TV movie version of A Raisin in the Sun? SL: We had a good time. And it was nice to be able to do the movie after doing so many shows on Broadway. And having it so well received was just kind of awesome. Back when we were doing it on stage, I would never have guessed that we’d get to turn it into a movie. SL: No, I think people cover everything. SL: I'm super-happy! Of course I have my days, but overall, I feel very blessed, like I'm in a good place in life. I want to continue growing as a person and as an actress, and at the same time I feel very good about where I am. So, yes, I'm happy. SL: Of course, absolutely. Just being a free-lance artist, where you go from job to job, there are times in between where you don't know how you're going to pay your bills. Even at my level, you don't know what's coming next sometimes, and you just have to have faith. SL: I'm such a bookworm, too. 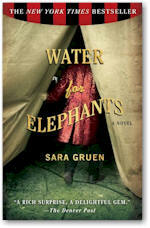 I just finished reading Water for Elephants by Sara Gruen. 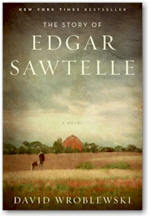 And now I'm starting another novel called The Story of Edgar Sawtelle. KW: Have you ever been disappointed? SL: [Sarcastically] No. [Laughs] Yeah, I get disappointed, because whenever you're an ambitious person, you have to dream big and then let God take care of it. The truth is, you're not the one in control. You gotta let it go. So, of course there are disappointments. But you have to get up, dust yourself off, and keep it moving. KW: The Heather Covington question: What music are you listening to right now? KW: The ’Realtor to the Stars' Jimmy Bayan question: Where in L.A. do you live, generally speaking? SL: How do I want to be remembered? I don't know. That question's too deep for me right now. I've been up since 4 A.M. and I don't want to give you an answer that I'm going to regret. KW: Gee, I'm sorry for putting a strain on you. SL: No, I'm sorry I couldn't answer all your questions. It's just that my brain is a little tired. KW: No need to apologize. You've been great. SL: Thank you, and good luck with everything.